1939 INK SPOTS It's Funny To Everyone But Me / Just For A Thrill V+ 78 10"
Ink Spots, Decca #2507. It's Funny To Everyone But Me/Just For...,78 rpm,10",Ex. Sorry, no matches on iTunes for "Just For Me Ink Spots". 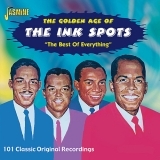 Sorry, no matches on Amazon MP3 for "Just For Me Ink Spots".